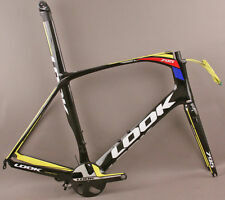 Look bike frame. Condition is Used good condition. Wheel size is 700c. Uses a English threaded bottom bracket. Rake: 45 degrees. Top Tube length: 57 cm. Great for racing but also my "go to" bike for centuries and other long rides b/c it is so comfortable. I've ridden it with aero wheels and climbing wheels and it excels at both. The chainrings are well worn, but do not skip at all. Look 496 L96 Fork Medium (Fork Only) . Condition is New. Shipped with USPS Parcel Select Ground. Much more precise in any circumstances. Carbone type Carbon HM. HM oversized carbon tubes with oversized lugs It's Circa 2003/04, but when I got it last year, it was in almost unused shape and still in in great shape. Horizontal Top Tube: 585 mm. Fork Steerer Size: 1-1/8". Seat Tube: 600 mm (center bb to top of seat tube). Bottom Bracket Type: Threaded BSA. Seat Tube: 575 mm (center to center). Material: Carbon. Serial No. B56 KC 2883 C9. Could be a 1989 model year?. Overall it's in good, solid condition. No cracks, breaks, or bends. Markings from front derailleur clamp. Accommodates English Threaded BSA BB30 Bottom Bracket. HM 130 g/M² Carbon Fabric w/Monocoque Construction. Alloy Front and Rear Derailleur Hangers. Head Tube:16 cm. 695 AERO TECHNOLOGY. The ZED 2 is a 100% carbon monobloc crank with unequaled weight/stiffness ratio. It can be inverted, allowing for a range of 17Âº to -13Âº, giving you maximum versatility. For over 30 years, LOOK has developed the unique experience and expertise to combine different types of fibers to achieve specific characteristics. We have provided high resolution photos for your convenience. We opened Orange County Cyclery in 2009. We are Orange County Cyclery. THIS ITEM IS ALSO FOR SALE LOCALLY. ITEM CAN BE SEEN IN PERSON AT OUR WAREHOUSE IN HUNTINGTON BEACH, CA . A distance of 100km, on a flat course, with an average power of 300W, would represent a gain of a full minute and 14 seconds. 795 AERO TECHNOLOGY. Their stiffness is very high, on average double that of HR fibers. Carbon fork. Internal top tube cable routing. Minimal Scratches and sign of use but excelente condition. Fastest bike I ridden. I can send you a picture of him signing the bike if you buy the bike. The bike has a GXP BB with a sram red crank set installed on and chain rings are 53 39. Look 496 L96 Fork Size Small (Fork Only). Condition is New. Shipped with USPS Parcel Select Ground. The fork is a full carbon including the steerer tube. Top Tube (c-c) 56cm. Seat Tube (c-top of seat tube) 58cm Center to top of seat tube. Head Tube 15.8cm. THIS BIKE IS "ZR" - READY FOR THE LOOK ZED3 CRANK! (will fit traditional PF30 cranks as well). - PF 30 bottom bracket shell (through adapter plates). Crankset: Carbon Look Zed 2. Fork: Look Carbon. Stem: Look Carbon Stem. Adjustable degree from -9° - 13°. Five Year Manufacturer Warranty. we are an authorized Look USA dealer. Full carbon fork. Internal top tube cable routing. 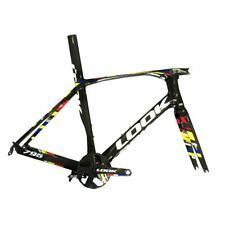 LOOK 496 w/ updated Look L96 fork XS ***track frame set only** Size: XS 52cm Includes: Frame/fork/seatpost/100mm stem No cracks Never been crashed. Look Zed 3 chainrings are required for proper function. Let us know if you want a price quote on these rings. The front brake is integrated into the fork and the brake cable runs through the stem and into the steerer tube. VOLUSIZE 5.9. SIZE: 59CM TOP TUBE. SPACING: 101 FRONT & 130 REAR MM. YOU WILL NEED FRONT DERAILLEUR HANGER. Build is 3T aerobar and ultegra 6800 gruppo (crank is the Look Zed crank with adjustable 170/172.5/175 stem lengths), Mavic Aksum Wheels and Continental Ultrashort II 700x25 tires. One of the nicer bikes I've owned, just downsizing. Crankset: Carbon Look Zed 2. Fork: Look Carbon. Stem: Look Carbon Aero Stem. Adjustable degree from -9° - 13°. Five Year Manufacturer Warranty. we are an authorized Look USA dealer. 695 AEROLIGHT POWER AND PRECISION. The 695 AEROLIGHT is a very light and reactive bicycle. Equipped with an AEROSTEM and an HSC7 fork, it is incredibly responsive providing you increased agility. The ZED 2 is a 100% carbon monobloc crank with unequaled weight/stiffness ratio. With the entirety of its components being integrated, the 795 — and particularly the 795 Aerolight, with its incorporated brakes, pushes performance limits even further. A distance of 100km, on a flat course, with an average power of 300W, would represent a gain of a full minute and 14 seconds. Pristine condition with minimal but normal nicks and wear marks. Never crashed. One owner and well-cared for. Rear derailleur: Shimano Dura Ace. Rims: Mavic Open Pro with Dura Ace hubs, front 28 hole/rear 32 hole, DT Revolution spokes (28) and 14-15g double butted (32). Seat tube length (from bb center to top of seat tube) 620mm. Size is S (small). Below are the specs Size S (Small). Fits rider 5'5"-5’11’’. 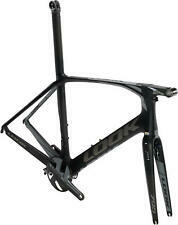 - Fork: Original carbon LOOK 596. - Stem: Original integrated carbon LOOK 596 stem. - Brakeset: Black SRAM Rival. A distance of 100km, on a flat course, with an average power of 300W, would represent a gain of a full minute and 14 seconds. The ZED 3 is a 100% carbon monobloc crank with unequaled weight/stiffness ratio. With the entirety of its components being integrated, the 795 Aerolight pushes performance limits even further. Over a distance of 100km, on a flat course, with an average power of 300W, this would represent a gain of a full minute and 14 seconds. All sale prices subject to change. FLAT MOUNT DISC BRAKES. All sale prices subject to change. This technology is the result of the combination of 2 types of fibers from different materials: carbon (High Modulus) and flax linen fibers. Aerostem is 110mm. (ZED2 works with 110mm Compact & 130mm Standard). Zed 2 One piece crank works with either Compact (110BCD) or Standard (130BCD) - super stiff @ 320g! Here's the story. I built up a Look 695 in the fall of 2016. This technology is the result of the combination of two types of fibers from different materials: high modulus carbon and flax linen fibers. Flax linen fibers at those locations, sandwiched between two carbon sheets, add natural vibration dampening to your ride. 2013 Look 596 Pro Team .small carbon frameset E-post CeramicSpeed BB quarq power meter 165 , dash saddle, zip vuka cockpit, sram etap 11 speed, Look carbon pedal Camp fulcrum wheelset .QXL Rotor Qrings, Cane Creek ee brakes. time trial. Condition is Used. Shipped with USPS Priority Mail. All spacers are included. Very nice bike, no cracks no Return. Sram ETAP electronic shift.